The Los Angelino pop rock group Maroon 5 are one the new breed – a fifth generation band for modern times who understand that music now is about cross-fertilisation and treating your influences with appropriate respect without being overawed by the greats of the past. Citing a diverse mix of classic acts from Talking Heads and Stevie Wonder to The Police and Queens of the Stone Age, Maroon 5 are nevertheless a self-contained unit with an individual ear for melody and an eye for dynamic stage performance. Their style is based on minor key nuances with bedrock of funk and heartfelt passion. Definitely a rare jewel in our crown we’re delighted to recommend the epic albums from Songs About Jane to the recent V and an unbroken chain of magnificent single hits that have steadily gathered Platinum and Gold – we’re talking about pop standards now like “Harder to Breathe” and the floor filling “This Love”, the party favourite “Makes Me Wonder” and the stone cold triumphs of “Moves Like Jagger” and the up to date smashes “One More Night” and “Maps”. In the ten years since they formed in earnest Maroon 5 have sold over 27 million albums worldwide and 30 million plus singles – a remarkable achievement in the digital download era. In 2013 they were the third most played act on Top 40 Mainstream radio, thus cementing themselves as a band for all the people who still retain a strong independent streak with the credibility to keep fans delirious and critics appreciative. Backing all this up Maroon 5 also have three Grammy Awards and sundry Billboard Music and American Music Awards – though they may be prouder still of their 2005 Environmental Media Awards – they donated that year’s tour profits to the Global Cool movement. Great guys, great musicians. Their roots go back to mutual friendships at Brentwood High School in Los Angeles and the early formation of the group Kira’s Flowers. Adam Levine and Jesse Carmichael united with Ryan Dusick and Micky Madden for beach party shindigs in Malibu before releasing the Britpop styled The Fourth Word, a fine enough affair that didn’t sell. As the years rolled on it became apparent that front man Levine needed a guitar foil and the gifted James Valentine quit his other band The Square once he heard the songs – this after the great John Mayer had been so impressed with the emergent Maroon 5 that he took them on his 2003 tour. Evidently an act where quality and style triumph over shadow fashion consciousness Maroon 5’s immediate appeal was so apparent that it felt like they’d been around for ages. Their accomplished EP 1.22.03, recorded live at the Hit Factory, NYC enhances that supposition as it contains two originals and two covers – The Beatles “If I Fell” and AC/DC’s “Highway to Hell” – eclectic and fun. Similarly, Live – Friday the 13th, recorded at the Santa Barbara Bowl is another must-have CD and DVD that already sounds like a greatest hits. Second album proper is It Won’t Be Soon Before Long where drummer Ryan Dusick is credited as Musical Director. An even more ambitious project than the debut this album is a benchmark for modern production sound and contains the glittering hits “Makes Me Wonder”, “Wake Up Call”, “Won’t Go Home Without You” and “If I Never See Your Face Again”, the latter re-recorded with guest artist Rihanna. At this time the Maroon men make a conscious decision to embrace mainstream values while bringing their subversive slant to proceedings. Small club dates and prime time TV shows were the order of the day as if to prove you can have the best of both worlds. Available in several formats it’s well worth seeking out the Special Version for subtle and exciting changes of tonality and dynamics. You can tell a band has struck pay dirt when even a set like The B-side Collection stalks the chart. This includes many of Levine’s favourite tracks that were omitted from the parent discs. Of similar interest is Call and Response – The Remix Album, where Mark Ronson weaves his magic on “Wake Up Call” featuring Mary J. Blige and Pharrell Williams remixes “She Will Be Loved”. With other hands-on production princes like Of Montreal, David Banner and Paul Oakenfold on board this is a firm favourite around here. Totally recommended. Back to the source for Hands All Over (2010) with British console maestro Mutt Lange at the desk on a set of highly soulful but typical Maroon 5 magnificence. The obvious standout here is “Moves Like Jagger” featuring Christina Aguilera, one of those timeless cuts that take on a life of its own. In keeping with their status the promotion for this album moved from A Victoria’s Secret Fashion Show to the 54th Grammy Awards where Maroon 5 and Foster the People joined the Beach Boys to celebrate the surf gods’ 50th Anniversary. Jesse Carmichael’s departure didn’t stop fourth album Overexposed from doing the business. Gems like “Love Somebody” and “One More Night” seem to have given the group a quasi-Beatle-like eminence and early in 2014 they repeated their Beach Boys episode by taking part in The Night that Changed America, marking the arrival of the Fabs in the USA: here they played “All My Loving” and “Ticket to Ride”. To the present and latest album V, wherein Carmichael returns to the fold and the accent is a return to the darker shadows of Songs About Jane. There are other shifts: Max Martin brings in a distinct Euro electropop mood with Levine’s vocals amongst his finest to date. The key collaboration now is with Gwen Stefani on the moody “My Heart Is Open”. If the atmospherics are memorable and easily appreciated that’s a quality to be praised. Maroon 5’s position in the pantheon is assured – their fame stretches from America to the Far East where they are revered. At time of writing V has already hit the top of the US charts and becomes a fixture in the UK. Who knows what the future holds? Judging by the extras on the Deluxe edition – especially the Gregg ‘New Radicals’ Alexander and Danielle Brisebois penned “Lost Stars” the music is just going to get better and better. Watch this space, Marooners. Doubling down on the blue-eyed soul that’s always been their cornerstone, Maroon 5 up the ante on Hands All Over, stripping their rock to the bare minimum, giving every song, even the power ballads, an immaculate tight groove. It is the exact opposite move expected from the hiring of superstar producer Robert John “Mutt” Lange, the man responsible for some of the greatest hard rock and heavy metal albums in history, but Lange has a knack for focusing on the elements that define a band’s core character, and with Maroon 5 he’s realized how Adam Levine possesses a relative lack of lead singer ego. He is undoubtedly the superstar of the outfit -- the skinny pretty boy with the high voice -- but all things considered, he disappears within his band, co-writing much of the album with keyboardist Jesse Carmichael, letting the song and vibe take precedence over performance. Lange preserves this dynamic, turning Maroon 5 into a clean, efficient machine. There is no fat on Hands All Over -- in its standard edition, its 12 songs run a crisp 40 minutes, with no song cresting over the four-minute mark -- and the sound is blindingly bright, almost incandescent in its spotless surfaces. As pristine as the sound is, Hands All Over is not sterile and Lange retains the group’s sense of soul. If anything, his precision is an asset, as it not only accentuates Maroon 5’s essential character as well-tailored lovermen, his focus echoes down to the songs themselves. Some of the cuts may not sink their hooks in immediately, but track for track Hands All Over is Maroon 5’s best album, capturing their character and craft in a cool, sleek package. 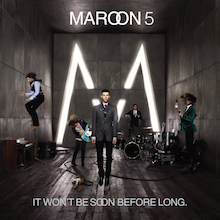 Maroon 5 settled into a cleanly contoured blue-eyed soul groove on 2010's Hands All Over and were rewarded with a clear commercial stumble -- a situation somewhat forgotten in light of Adam Levine's 2011 elevation to superstardom via his judgeship on The Voice. Levine didn't abandon his band once he became a TV star. Just as the first season finished, Maroon 5 recorded a duet with Christina Aguilera, "Moves Like Jagger," a single far more modern than anything on Hands All Over and, not surprisingly, a much bigger hit than anything from that 2010 LP. 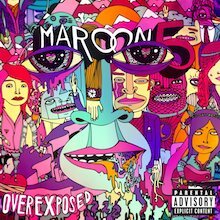 All this set the stage for 2012's Overexposed, its title a smirking allusion to Levine's ubiquity, its sound a reflection of how dearly the group wishes to retain the large audience they won once again with "Moves Like Jagger." Electronic rhythms easily overshadow acoustic rhythms, with even the natural swing playing as somewhat sequenced; each song gets a brittle, multipurpose surface, as easily adaptable for adult contemporary radio as it is for the club. Hooks stab with a steely confidence but they just break the skin; they prick instead of pierce. It's the productions that count, not the songs. What matters is the their cool, sleek sound, the glassiness of the ballads, the cold glint of the dance-pop that dominates this record. Maroon 5's soft swing as a band is pushed to the background -- a bonus closing cover of Prince's "Kiss" makes that shift apparent, as the band reworks it into a rockabilly shuffle worthy of Elvis' stage show -- and it's missed, but not greatly. Even if Levine's voice sounds a trifle thin in these cool, crisp settings, the band -- with the assistance of such guaranteed hitmakers as Max Martin, Shellback, and Ryan Tedder; Levine's usual co-writer and lead guitarist James Valentine only has four credits here -- is adept at navigating modern pop waters, creating a record that feels briskly contemporary. They've bent with the times instead of attempting to have the fashion follow them, which may be a wise move after the general disregard paid to Hands All Over -- Overexposed may not hold together as well as that album, but it's sure to keep the audience won over by The Voice. Maroon 5's 2002 debut album, Songs About Jane, was the kind of hit that doesn't happen often in the new millennium -- a genuine word-of-mouth hit whose popularity grew steadily after its release, largely due to the sweet, sunny hit "This Love," a song sly and catchy enough to stay on the adult pop charts for years without wearing out its welcome. It also was catchy enough to engender years of goodwill. Five years of goodwill, in fact, as the band toured heavily while slowly tinkering away on their second album, finally delivering It Won't Be Soon Before Long (its title perhaps a pun on the gap between records, perhaps not) half a decade after Songs About Jane. If that delay sounds like a symptom of sophomore jitters, that's not exactly true, since during that long stretch between albums Maroon 5 worked Songs About Jane and, in a sense, that album wasn't strictly their first album, either. Maroon 5 evolved out of Kara's Flowers, a post-grunge pop band whose 1997 debut never took off, not even when their debut was reissued in the wake of Maroon's success, but it did provide the group with the foundation for their success; it's where they paid their dues and learned how to be a pop band. Traces of Kara's Flowers could be heard in Maroon's rockier moments on their debut, but under their new name, the group began to develop an infatuation with blue-eyed soul-pop, which they wisely develop on It Won't Be Soon Before Long. More than develop, they modernize it, borrowing elements of Justin Timberlake's stylized synthesized soul, but Adam Levine is wise enough to know that he's no young colt, like JT. He knows that he's a pop guy, somewhat in the tradition of Hall & Oates, but he isn't trying to be retro, he's trying to fill that void, making records that are melodic, stylish, and soulful, which It Won't Be Soon Before Long certainly is. In every respect, It Won't Be Soon is a bigger album than its predecessor: hooks pile up one after another, there's not an ounce of fat on the songs, the production is so immaculate that it glistens. If there were lingering elements of Maroon 5's alt-rock past on Songs About Jane -- primarily in its lazy, hazy vibe -- they're gone now, replaced by the sleek, assured sound of a band that's eager to embrace its status as the big American mainstream pop band of the decade. 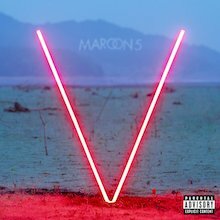 But Maroon 5 isn't desperately grasping at the brass ring, they're playing it smart, building upon the core strengths of their debut and crafting a record that's designed to appeal to many different listeners, from teens crushing on Nelly Furtado's R&B makeover to adults looking for something smooth and melodic. It Won't Be Soon Before Long appeals to both audiences with an ease that seems effortless, but like any modern blockbuster, this album was shepherded by several different teams of producers, all brought in to emphasize a different personality within the group. The bulk of the record was cut with Spike Stent and Mike Elizondo -- Stent worked with U2, Oasis, Björk, and Gwen Stefani, while Elizondo had produced Fiona Apple and Pink -- but Queens of the Stone Age producer Eric Valentine was brought in for a couple of cuts, as was Mark Endert, who mixed "This Love." There may have been three different sets of producers, but the album is streamlined and seamless, never seeming calculated even if it was clearly made with an eye on mass appeal, and there are two reasons for that. First, Maroon 5 has gelled as a band, developing a clean, crisp attack that may bear traces of its influences -- there are knowing references to Prince, the Police, even OutKast sprinkled throughout (the keyboard on "Little of Your Time" is a direct nod to "Hey Ya") -- but it's a sound that's instantly identifiable as the band's own signature. Nowhere is that more evident than in how they can give soulful grooves like "If I Never See Your Face Again" a rock edge -- or how they can suddenly explode into shards of noise as they do on the coda of "Kiwi" -- or how when the electronic instruments dominate the production, the music still breathes like the work of an actual band, not like something that was constructed on a computer. But like with any good blue-eyed soul, the reason that this album works is the songs themselves. Even the flashiest production-driven tracks here -- the opening one-two punch of "If I Never See Your Face Again" and "Makes Me Wonder" -- aren't about feel; they're about the songs, which are uniformly tight and tuneful, sounding better with repeated plays, the way any radio-oriented pop should. If some of the ballads aren't as distinguished as the livelier tracks, they nevertheless are as sharply crafted as the rest, and the end result is that It Won't Be Soon Before Long is that rare self-stylized blockbuster album that sounds as big and satisfying as was intended. It wasn't noted much at the time, but founding keyboardist Jesse Carmichael sat out Maroon 5's 2012 album Overexposed -- a circumstance that just happened to coincide with Adam Levine capitalizing on his Voice-fueled stardom. Overexposed and over-filled with guest producers and songwriters drafted to compensate for the absent Carmichael, rapper Wiz Khalifa, reliable Swedish hitmakers Max Martin & Shellback, and icy OneRepublic frontman Ryan Tedder gave the group a steely sleekness to suit contemporary charts. Some of this is retained on V, the 2014 record that marks Carmichael's return to the group, partially because all those guests save Khalifa return for a second helping. The absence of the rapper suggests Maroon 5 aren't quite as concerned with sounding youthful as they were last time around, which is generally true. Some tracks maintain the glossy veneer that overwhelmed Overexposed -- not entirely a surprise with Martin billed as the record's executive producer -- and, despite some unnecessary vocal processing on Levine scattered throughout the record, these are largely the ones featuring returning guests: Tedder co-writes and co-produces the album's lead single, "Maps," a song where Levine's Sting mannerisms steamroll the hooks," while Shellback helms "Animals," "In Your Pocket," and "Feelings," with all but the last placing emphasis on brittle beats. Elsewhere, the vibe shifts slightly back to the soulful pop that's remained at Maroon 5's core since the beginning, here given an ever so slight maturation to balance the modern moves heard on the rest of the record. Sometimes, the group achieves a delicate balance between the two extremes -- "It Was Always You," "New Love," and the aforementioned "Feelings" -- but the best moments on V are when Maroon 5 embrace the tuneful, slightly soulful adult contemporary pop band they've always been, as they do on "Sugar," "Coming Back for You," and the Gwen Stefani duet "My Heart Is Open."